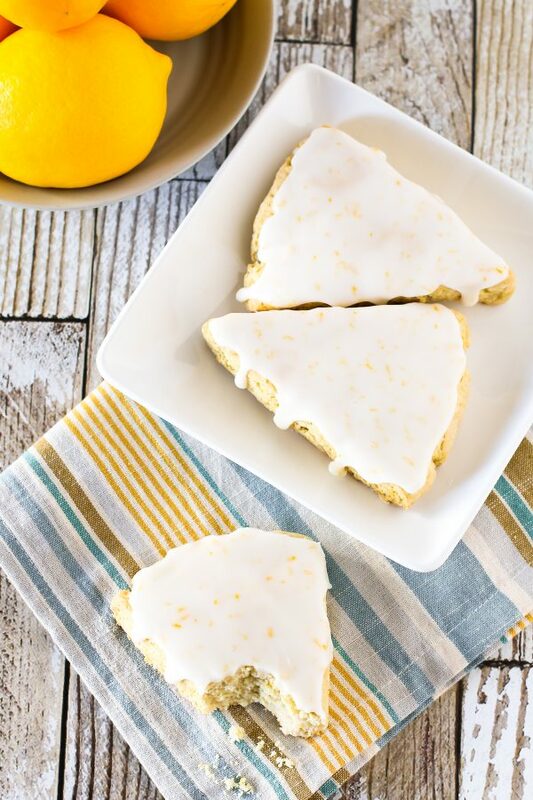 When you’re given a bag of beautiful Meyer lemons, you make gluten free vegan glazed lemon scones! Tender scones with a zesty lemon glaze. A simple, slightly sweet morning treat. My mom has a huge Meyer lemon tree in her backyard. It’s covered in gorgeous lemons right now and so she’s passing on bags and bags of lemons. They have amazing flavor and are also slightly sweeter than traditional lemons. I never say no to a bag of Meyer lemons! Being that I love all things lemon, I knew I wanted to bake something with these flavorful lemons. Lemon cookies are always a good idea, but I went with these simple glazed lemon scones. Scones are one of my many weaknesses. Like, I can’t eat just one. They aren’t overly sweet and the soft, crumbly texture is irresistible. Morning coffee + freshly baked scone = the perfect breakfast. 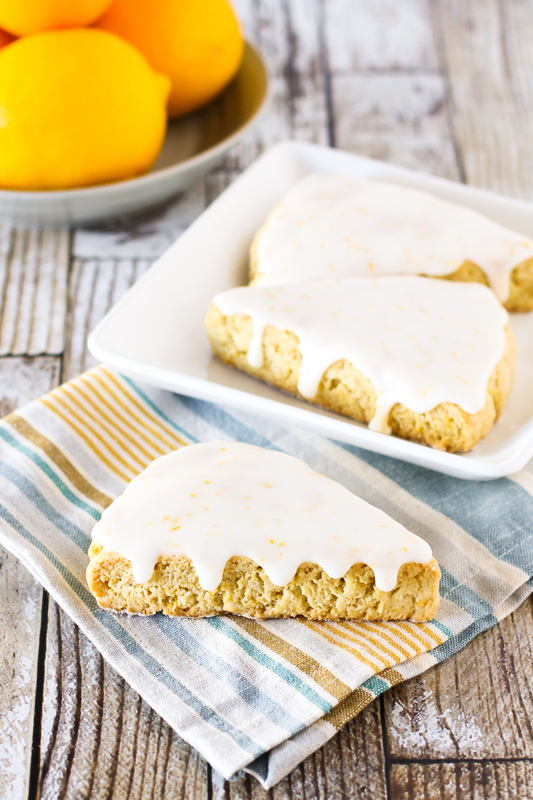 These gluten free vegan glazed lemon scones take no time at all to mix up. While they are baking, you will have the most amazing lemon scent billowing through your home. It’s fantastic! I like a good glaze on my scones so I made this one with just powered sugar, lemon juice and lemon zest. See all those tiny flecks of zest? Yep, that’s the amazing lemon flavor right there. 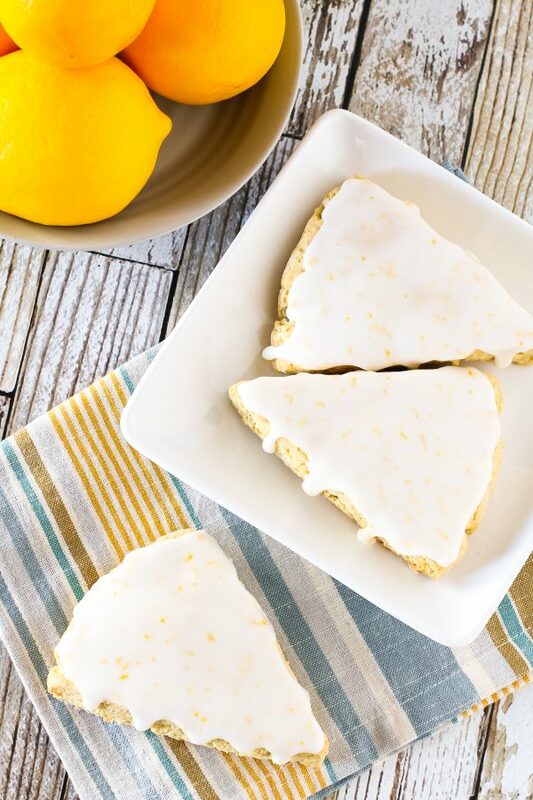 If you weren’t a scone believer before, these gluten free vegan glazed lemon scones will surely convert you. They are just that good! In large mixing bowl, whisk together flour, sugar, lemon zest, baking powder, baking soda and salt. Using pastry cutter or fork, cut in shortening until small pieces remain. Mix together almond milk, lemon juice and vanilla. Pour over flour mixture. 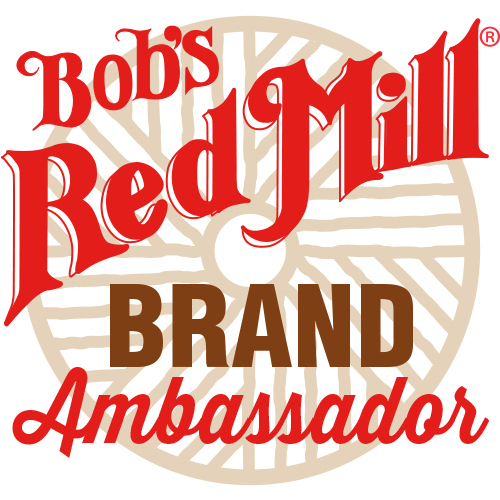 Using rubber spatula, gently blend until dough just comes together. Place dough on flat surface dusted with gluten free flour. Gently pat into 9-inch circle, about 1 inch thick. Using pizza cutter or sharp knife, cut dough into 8 triangles. Place scones on prepared baking pan. Bake 18-22 minutes, until golden brown. Remove from oven and cool slightly on cooling rack. To make glaze, stir together powdered sugar, lemon juice and lemon zest until smooth. Spread over cooled scones. Allow to set 15-20 minutes, for glaze to harden.